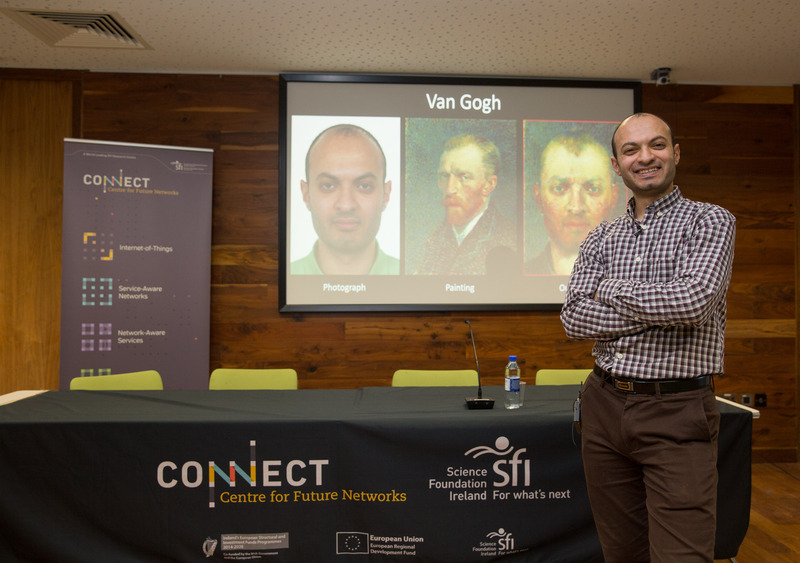 Dr Ahmed Selim of brings Van Gogh to life by demonstrating a new machine learning technique. Dr Ahmed Selim has presented a new machine learning portrait technique capable of producing head portraits in the style of a given artist. The technique uses Deep Learning, which is a form of Machine Learning, to extract details from the photograph of an individual and combine these with details from a sample of an artist’s work. A painting is then produced of that individual in the style of the artist. The technique has been developed by Dr Ahmed Selim in collaboration with Dr Mohammed Elgharib, at Qatar Computing Research Institute, and Professor Linda Doyle, Director of CONNECT and Professor of Engineering and the Arts at Trinity. Their work was presented at this year’s SIGGRAPH conference in California, the world’s largest and most prestigious international conference on Computer Graphics and Interactive Techniques. “Ahmed has combined cutting edge, Machine Learning techniques with some particularly creative insights to produce an output that is streets ahead of any of his competitors. “This technique uses complex algorithms to combine information about the identity of an individual with information from the style of an artist to produce a faithful head portrait. In essence, the machine is being taught to do the job of the painter.